UA’s groundbreaking tape emulation technology in an easy-to-use plug-in. 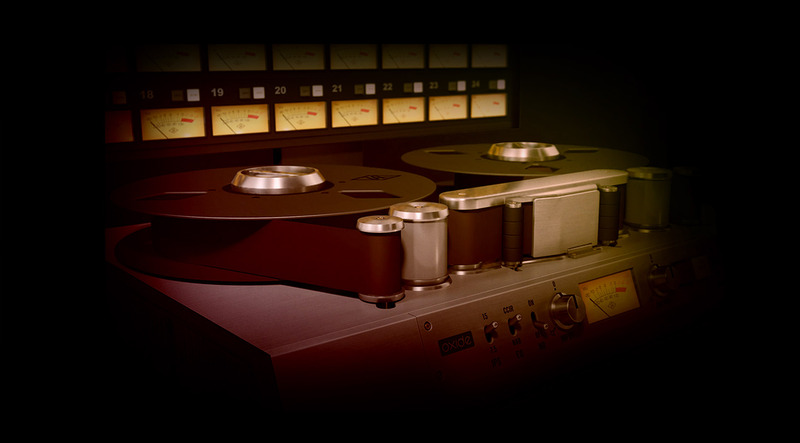 The Oxide Tape Recorder plug-in was engineered by the same team behind the industry-leading UAD Ampex ATR-102 Mastering Tape Machine and Studer A800 Multichannel Tape Machine plug-ins. Designed in conjunction with AES magnetic recording expert Jay McKnight, Oxide gives your tracks and mixes the warmth, presence, and vibe of professional analog tape. Whether you’re tracking in real time using an Apollo interface, or mixing in your DAW, Oxide’s intuitive controls deliver musical results for beginners and pros alike. Just select IPS (inches per second), EQ, and noise reduction settings, and tweak input and output controls to taste. By emulating fat tape compression and colorful circuit behaviors, Oxide gives your tracks and mixes the cohesive glue that only analog tape can provide. Easy GUI, DSP friendly and sounds great! I've demoed all the UAD tape sins, and while the Ampex and Studer are awesome and very tweakable (and over twice the price), Oxide holds it own and makes up for it's lack of options with near instant great tone. You really can do quite a bit with just the input and output alone. Using this a lot on drum busses and acoustic guitars, but it works on just about anything. Highly recommended. was a bit skeptical about tape saturation plug-ins. My friend said it was making a huge improvement to his mixes so I bit the bullet and bought the Oxide Tape Recorder plug-in. I have to say this plug-in is the difference maker. Its the biggest single improvement I have done to my mixes. The demo videos I have watched don't do it justice. I highly suggest everyone to try this out and hear for yourself what magic it can do to you mixes. Now that I have had some time behind the promotional plug-ins that come standard w the Apollo 8p and Twin Duo hardware, I needed something to add more depth and texture to my mix. I was holding out for sales on the Studier and Ampex tape recorders when, BAM, here is Oxide. Subtle, easy to use plug. It really brings out vocals when patched on a single track and gives the whole mix a round, whole feeling of context. Thanks for the coupons and keep those sales coming! Had the Studer and loved it but with just a Twin Duo couldn't afford the DSP to use it on every track. Oxide is the answer - for anyone using the more modest Apollo devices this gives you the Studer experience without the painful DSP usage. Incredible job UA! I have Slate VTM which is very, very subtle. I have j37 which is almost cartoonish but does serve a very real purpose. I love Oxide because it is realistic like slate but has a flavor like the J-37 without feeling "cartoonish". If you have UA's big brothers there's no need to get this but if you do not -- then this is a godsend. This will actually smooth up your tracks and make them just work together. I love it and it doesn't take much processing power. One of my goto plugins. Great job UA. Doing mostly acoustic work I appreciate clear sound, not saturated or compressed noticeably. Maybe that's why I never really got into the Tape-Thing until I heard Oxide-demo. I did a comparison with other VTC's, that either rhyme with 8 or something to do with atmosphere and sea, over 5 songs. I think I could, in the end, get my tracks to sound like that : opener and with a much clearer ambience. But it would take me a lot more time and several plugs. On the bus it really made a quick, one stop difference from "okay-ish" to "yeah-that's it" pulling instruments and vocals together in the stereo field. I do mostly use the 15 ips without overload on the input. Great! Thanks UAD for an affordable VTC. I've had the pleasure to work on real Studers and Otaris a few years back and I own a Tascam MS-16 1" tape machine, and both the UAD Studer and ATR plugs, so I guess I have a pretty good perspective on how tape really does sound and what plugins can do in terms of fatness and saturation. Being a little skeptical as this new plug was released, and owning it's biggest brothers (Studer and ATR) I thought this was just a cheaper version for people not willing to spend the 350 bucks. That was until I demoed it! Oxide is a completely different beast than its older brothers. It imparts attitude and 3Dness that I love. It's a must for all tape aficionados & saturation seekers. This is not an upgrade/downgrade from other plugs, its something else. Using most tape emulations is a waste of time, as the majority of them don't 'react' like tape does and therefore they always seem to fall short. This doesn't. It's magic. It lifts, adds warmth and the right amount of saturation to really fool the ear. Working in the box, in a home studio set up, aiming to get close to that pro studio sound without spending thousands of pounds on actual tape? This is your safest bet. It will do what most plugins claim to do, but most don't fulfill - It will make your mix sound better. Well done to the wizards of Universal Audio. If you don't already own the Studer A 800, then this is for you. If you want to 'just grab a preset and hear a change", this is for you. If you've used the 'real thing' for many years, you may prefer the flexibility of either the ART or Studer. Exactly what VTM users are looking for in a UAD style Tape Machine. Simple, effective gets the job done and then some. For users afraid of the 15ips sound for "modern sounding" reasons, try messing around with the EQ curves as well. You'll be surprised. i've always been a bit dubious about these tape style plug ins. Often I have difficulty hearing the difference. Not this time! Having tried it out on a real job i was mixing fro a corporate film I was thrilled with the results, It's in my must have UAD list. Yours too probably! Basically a poor man's Studer - and it's great! I've worked with the Studer and Ampex plug-ins here and actually found them a little too feature packed - when I'm quickly looking for a nice tape effect the Oxide is a perfect place to start. And obviously the DSP hit is so much less than with the Studer/Ampex - great job UAD! Just The Touch of Warmth Needed!! Wow, Warm, Punchy.. Love it, Easy to use .. Just slap it on Dial a little or grab a easy Preset. Instant Love is what I Hear. Simple Results! Good plugin, but nothing to do with the ATR 102, which remains my favorite. One could compare it with the Studer A800, the settings are simple, the presets are not all to my taste !!! The price is very interested, but I prefer to choose other quoted above. Simple, easy to use, and effective. Imparts a desired sonic character... Works nicely/most effective when applied across lots of tracks, which is actually possible as it is not such the DSP 'hog' as the ATR or Studer A800.. have been using this plug in on every mix.